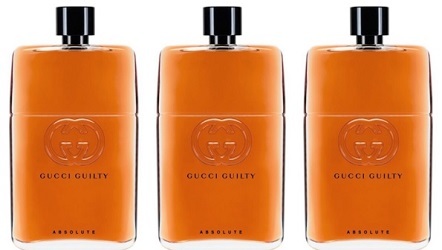 There's been lots of Internet chatter about Gucci Guilty Absolute Pour Homme1 (henceforth referred to as "Guilty Absolute"). Fragrance commenters on Basenotes are divided about Guilty Absolute's aromas: "unexpected" (speedracer), "headache-inducing...engine oil" (Zgb), "an old pick-up my father owned" (odioustoilet) and "the smell of band-aids" (The_Cologneist). "Absolutely disgusting. It smells like it would numb your tongue if you licked it. I HONESTLY don't know how Gucci could release such an abysmal cologne..."
"I sampled and bought this not knowing that is for men, it is absolutely divine. This is a very heady, spicy scent, best in winter. If you like Opium, Coco, Shalimar, etc., you will probably like this, I find it absolutely seductive." Engine oil, vintage pick-up trucks, BAND-AID® scent, and tongue-numb'ers are my kinda fragrance notes (and I wear Shalimar Extrait all winter). Guilty Absolute also intrigued me because perfumer Alberto Morillas used a (supposedly) natural extract of a local ingredient: Nootka Cypress (found growing where I live in the coastal Pacific Northwest). After sniffing Guilty Absolute I must say unless the BAND-AIDs are scented by Hermès, the engine oil is made of resins, and the pick-up truck it powers is used regularly by Morillas on his perfume-making rounds, I can't agree with the comments above! (I hope none of you are licking or drinking perfume, either...no doubt it will numb your tongue.) To me, Guilty Absolute is a delightful wood-centric (not eccentric) fragrance. Gucci claims Guilty Absolute is linear: "The scent is defined by a singular fragrance structure, rather than the traditional fragrance pyramid of a base, heart and top note.... Once applied, the fragrance remains unchanged on one’s skin." On my skin, there is a shift between the first few hours of wear (wood, Wood and more WOOD) and Guilty Absolute's base. Guilty Absolute begins with a lovely, natural-smelling, sweet/resinous (almost-milky) wood note, part cedar-part cypress; at first, the scent is STRONG (and a bit medicinal in character). Vetiver joins the wood note quickly and it's a hefty vetiver (this phase brought to mind Frédéric Malle Vétiver Extraordinaire). A musky leather aroma follows the vetiver but doesn't last too long. Guilty Absolute's base presents a dry cedar-cypress note combined with buoyant, vanillic patchouli. I enjoy Guilty Absolute from start to disappearance. Guilty Absolute, for all its apparent weight to the wearer, has minor sillage. It's a great perfume for work or to wear in close quarters and it's fine (light enough) for summer. Guilty Absolute's a contemplative (quiet) perfume and my favorite Gucci fragrance since the discontinued Eau de Gucci and Gucci Pour Homme. Similar fragrances with more sillage would be: Frédéric Malle Monsieur and Fiele Juniperus (too bad: Aesop Mystra has gone the way of the Dodo). Gucci Guilty Absolute Pour Homme is available in 50 ml ($78), 90 ml ($99) and 150 ml ($125) Eau de Parfum . 1. Listed fragrance notes of WoodLeather®, Goldenwood®, patchouli and vetiver. 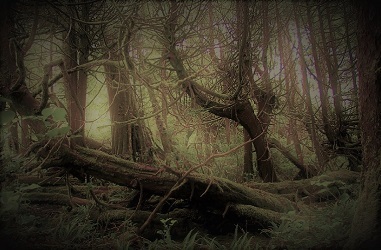 Note: middle image is Nootka Cypress Cupressus nootkatensis along the trail to Skuna Bay, Nootka Island, Vancouver Island, British Columbia, Canada [altered] via Wikimedia Commons. Where’s the stunned emoticon when you need one? I obviously need to resample this as the first time (I swore it would also be the last), Guilty Absolute smelled to me like a loud, vile synthetic civet bomb. To be fair, I’d only tested it on a blotter which I then proceeded to sniff in disgust, wrinkling my nose several times over. I was similarly shocked to discover a few days later that my cousin’s friend had bought a bottle. Clearly I now need to try it on skin. Dusan…ha! Let’s see what others say…maybe I can’t smell what is repelling other wearers? Or I have reached the stage where not much repels me…perfume nirvana? I love this one, so do try on skin. I guess I’m in minority and so doubly curious to find out what it is I’ve been missing out on. Will report back! Yes, you must report back. get home ASAP and scrub it off! ???? Dusan, ha! Are there two versions making the rounds?! On me it smells very natural and quiet. To quote YOU: more for me!???? I was thinking the same thing: the tester must be a dud! But no, it’s me and only me. Thank you Kevin, great review! I have sampled it a couple of times and I think its fabulous. It’s like a long lost relative of Bulgari Black, or as if Tom Ford returner to Gucci and decided to wreck havoc amongst the mainstream scent by fireing up a barbecue in a very old forest and bottle the resinous remains. I will probably hoard bottles of Guilty absolute, as I predict it will be discontinued pretty soon, unfortunately. Anna…I was thinking the same — stock up! Strange how something likes this gets launched; not only in 2017, not only from the mainstream department, but from Gucci. Surprisingly good, kind of Tom Ford esque destined to either get discontinued or if it stays, highly reformulated or flankerized. The big 150 ml size is coming home. WELL. I am speechless, except to say, thanks for the wonderfully written review, as always! Noz…as Robin wrote to me–maybe there’s hope for Gucci Bloom, another Morillas creation with an interesting new ingredient. Koenigsberg…lots of good deals on samples on eBay the last time I looked. I have a sample of this and wore it for the Gucci or Givenchy Friday Community project. It veered quite masculine to me (not that I don’t ever wear masculines but this went a little over my tolerance for masculines) and I ended up layering with Le Labo Vanille 44. I re-read my comment for that Friday and noted that this smells like the much cheaper equivalent of the Dubai City Exclusive Le Labo Cuir 28..
hajusuuri: I can barely remember Cuir 28, but to me, it smelled more of leather and less of woods than Guilty Absolute. I still think that the fact that they released this as part of the ‘Gucci Guilty’ line is mind-bogglingly odd. It deserved a bottle design and name of its own and offered a brilliant break with the “old Gucci”, now that they have changed designer. HerrKirsch…even the sales associates were puzzled by that. Yeah I’m *so* late to the party on this. I need to sample it soon. Thank God Gucci got their head out of their a** a bit and finally released a worthy masculine. Mike: maybe Alessandro Michele is better at perfume that his predecessor…. I havent been impressed by (or even much enjoyed) Gucci for quite sometime as the recent juices are, quite mehh. I didnt expect anything nor did I read any reviews about it before sniffing. I was very pleasantly surprised and yes, I liked it too! I agree that it has the “oily” feel but that is oh so my cuppa tea! Although the name is Homme Intense, I think its worth a try for anybody who likes this sort of fragrance. I was pleasantly surprised to find that the Absolute has nothing to do with the Guilty line and I liked the fragrance. I agree with most of the description, but to me the vetiver is very different than the grassy one in Vetiver Extraordinaire, it’s rooty and very smoky (it reminds me of java vetiver oil). Sebastian, oh, I don’t think of VE’s vetiver as grassy at all…it’s very deep/rich on me with rootiness and a touch of smoke. I have an original bottle of VE…HOPE the fragrance has not been tampered with. Sebastian: oh…my bottle is about 8 years old! I’ll re-smell it next time I’m in Barneys New York. I was intrigued by your review so I made a stop at Sephora on my way home from work yesterday to check it out. I get where the engine oil impressions are coming from with Guilty Absolute. I could see myself wearing it in fall/winter when I want something smoky. Since it is fairly linear, it also seems like it could be fun for layering too. Sweetgrass…yes, I could see layering with a floral…I am going to try it with FM Une Rose. Despite all the negative reviews on the web, I actually enjoy Gucci Absolute. Fabio…Monsieur is great…and you can pick from a variety of sizes, too. I was shocked that his was actually good when I tried it, my ex that I broke up with recently had Gucci Pour Homme on his shelf and didn’t like it! I would always spray it when I went to his apt, only thing I miss about him! CB: Ha! I still have about a quarter bottle left of my last Gucci Pour Homme…just packed it away for summer today. If THAT was discontinued…??!! The axe may fall on Absolute. Your ex should have given you that bottle. LL: yes, it’s VERY nice. Just got a sample of the Absolute Femme…hope it’s as good.